Condition: as new, without defects. Dimensions: height 19 cm, the base is an equilateral triangle with sides of 7 cm, rounded. A small to medium size vase, made of two layers - one outer transparent crystal turquoaise intense blue, the other inside, opal, serving to enhance the color. The two layers are handblown - so glass is also called multilayered glass or cased glass or. The vase has an hourglass shape - two trunks of triangular pyramid, with modern and elegant simplicity, but its share of resistance - as aesthetic achievement, is that the artist manages, by varying the thickness of the outer layer of colored crystal, to obtain an effect the gradient very nice. Per Lutken, a designer of great value and importance, made these vases "Carnaby" for Holmegard, in the '50s. Carnaby vases are very expensive, you can check on the Net. 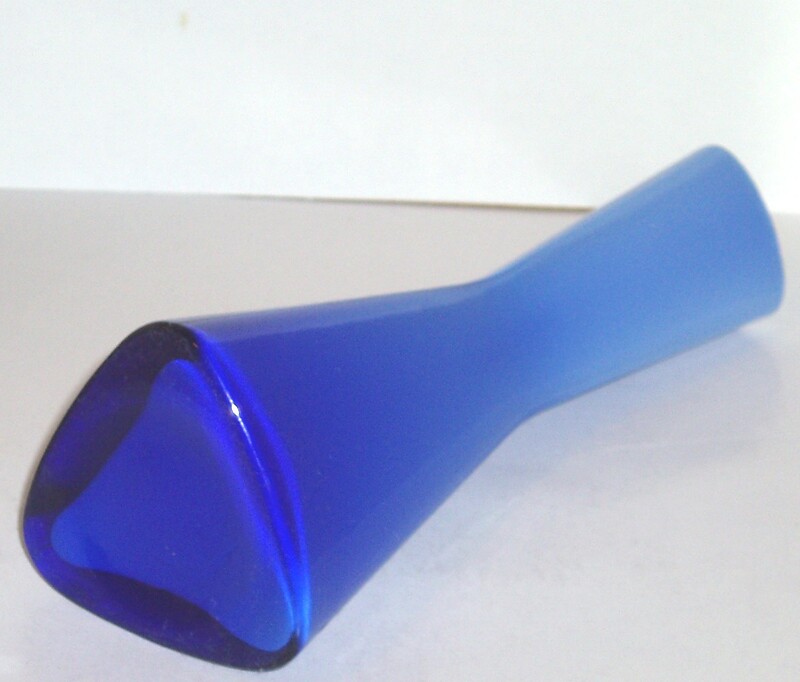 This vase is very rare in terms of shape and shade of blue.